With KurbSide Top Speed Race Simulator, your guest can test their skills on their favorite real-life track using the car they want. They will feel every bump, every crack, every little hill, gear change, g-force, contact lateral, vertical and longitudinal force; all completely adjustable to your taste. It is the ultimate racing training machine in Vr it’s like teleportation Oculus rift and HTC ready. 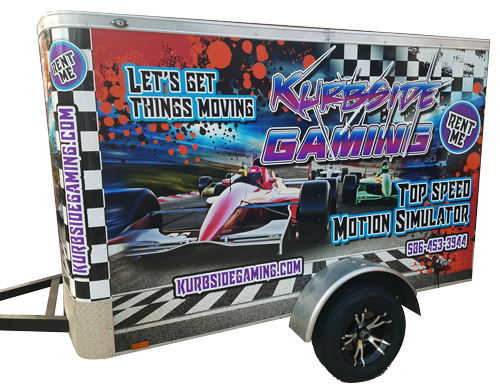 Kurbside Gaming has been providing quality portable video-gaming services to our loyal customers for 14 years. We are now excited to announce our latest addition to our Kurbside attractions: the Top Speed Race Simulator! You now have the ability to teleport your guests to their favorite race track where they will experience better-than real effects. Praised by professional race car drivers such as Ian Crerar and Jared Salinsky, even the most experienced of drivers are impressed by the quality performance one can feel from the steering wheel, gear-shifts, engines, and more.